Tickets to the upcoming December release of “Star Wars Episode VIII: The Last Jedi” will be a hot item, but employees of Westminster American Insurance Company don’t have to worry about finding a seat. For the past two years and again this year, the company has rented out a movie theater for employees and their immediate family members to see the much-buzzed about saga. Instead of waiting in long lines at coffee shops and chain stores, employees may start the work day by grabbing an espresso at the on-site lounge. Westminster American Insurance Company President and CEO John Scott Jr has also established a compressed work week where employees get every other Friday off. Some people say they don’t have time to exercise or the money to join a gym. At employee benefits company SIG, employees have an on-site gym that features visits from personal trainers, classes like Zumba and yoga and advice from a certified health coach. The firm’s office manager and employees come up with ideas including going to see “The Lion King” at The John F. Kennedy Center for the Performing Arts and a boat ride during the Cherry Blossom Festival. The expenditures are money well spent, according to Jaklitsch. When a position does become available, his firm “gets the cream of the crop” of applicants thanks to a good reputation. “Clients can enjoy having the best of the best handing their cases,” he said. The Daily Record has partnered with the Maryland Society for Human Resource Management and Best Companies Group to administer a two-part survey to determine which companies, nonprofits and government entities are the best to work for in the state. Applicants must have at least 15 permanent employees and be in business a minimum of one year. Employers complete the first part of the online survey detailing company policies, practices, benefits and demographics. Employees tackle the second part, either on paper or via online, answering more than 70 questions that use a scale of five points, ranging from ‘Agree Strongly’ to ‘Disagree Strongly.’ Topic categories range from relationship with supervisor, pay and benefits, overall engagement, and training, development and resources. · My supervisor treats me fairly. · There is room for me to advance in this organization. · My pay is fair for the work I perform. · I plan to continue my career with this organization for at least the next two years. The nine recognized companies received an average of between 88 and 94 percent topic approval ratings from employees and between 93 and 96 percent during the corporate portion. Some common themes? All of the winners offer bonus or incentive plans along with 401(k) plans with 89 percent matching employee contributions. Seventy-eight percent offer flexible or compressed work schedules. 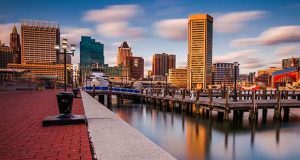 The nine companies identified as the Best Employers in Maryland also have longevity at the top – an average of 17 years for their CEO or highest-ranking executive. Electric Motor Repair Company General Manager Caroline Kauffman-Kirschnick recalled a conversation she once had with a consultant regarding work cultures. Electric Motor Repair was founded by her grandfather more than 80 years ago. Kauffman-Kirschnick says employees are viewed as family members and their hard work has led to the company’s success. Friday is pizza day, and the company annually puts on Halloween costume and Christmas decor contests. “One of the main components of our culture is to have fun and enjoy what we do,” she says. “It is a part of our code of conduct. … We believe that when you can create an environment that people have fun and can relax and enjoy themselves, it truly does” lead to employees being more productive and having a better mindset to get the work done. Those employers that made the list believe it is important to make their business a place where workers want to be employed. It’s simple: The talent pool for employees with skills, aptitude and a friendly, customer-service orientation is limited. “To be able to recruit and retain people and for people to want to come work at EMR, it is vital to the very thing that we do,” said Kauffman-Kirschnick. When Jaklitsch looks at how much businesses spend to advertise for help, interview, hire and then train people, he knows it is critical that his firm retains the best people once they hire them.